Intense Polish Therapy: Philosophy Loveswept Fragrance + Bottle inspired manicure! 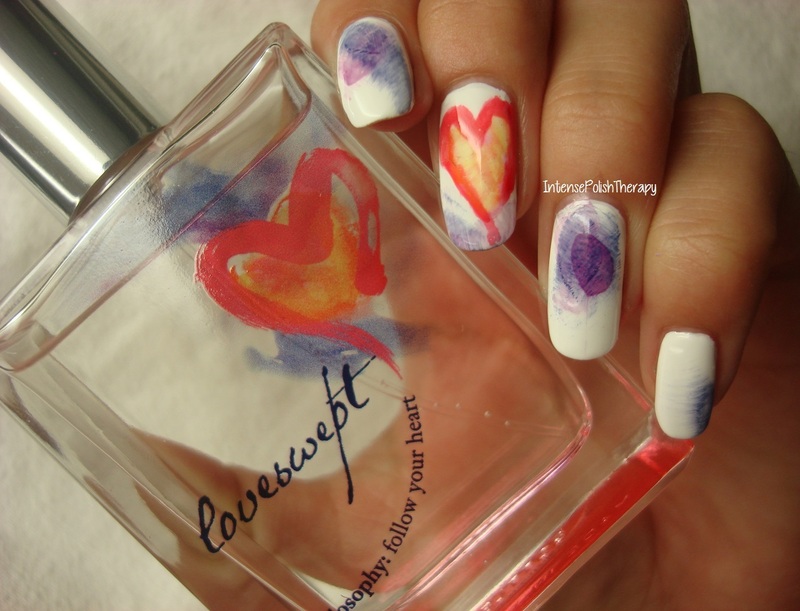 Philosophy Loveswept Fragrance + Bottle inspired manicure! Hey loverlies. Today I will be sharing not only a beautiful fragrance from Philosophy called Loveswept, but I'll also be sharing a manicure that was inspired by the bottle as well! So let's get started! At first spray all I smell is amber & citrus, then the more floral scents mixed with a hint of musk. I this it's perfect for spring & summer just because all of the notes are so full of life. I find the lasting strength pretty average, will last you about 5-7 hours depending on your day. I effing love this bottle it's very simple & adorable. I love that it's main focus is on the heart & name. Little needed to be done for this perfume. I think the personality of the bottle harmonizes with the scent so well. I would recommend this to almost anyone. However it's not a very sweet or sweet fruit scent. It's more of a fresh citrus & floral scent. So perfect for summer or a casual day.